Press Release (ePRNews.com) - PORTO SALVO, Portugal - Nov 29, 2016 - The aim of the FlexiFab project was to develop a flexible Friction Stir Welding (FSW) system capable of automatically fabricating complex structures, in a variety of joint configurations, from a range of aluminium alloy grades and thicknesses used in the transport sector. Aluminium has several unique characteristics which need to be considered when fusion welding. Without careful consideration, given its reactivity to air and high thermal conductivity/expansion, welds are prone to a wide variation of defects such as undercutting, excessive melt-through, incomplete fusion, incomplete joint penetration, porosity and cracking. This was the issue addressed by the project FlexiFab – “Flexible fabrication of lightweight aluminium transport structures”, sponsored by the EC FP7 Research for the benefit of SME associations, which started on November 1st 2013. FlexiFab has a wide scope of application areas covering all industrial aluminium welding. It will address the needs to improve labour productivity in the metal-working sector and alleviate the serious lack of skilled aluminium welding personnel in Europe. 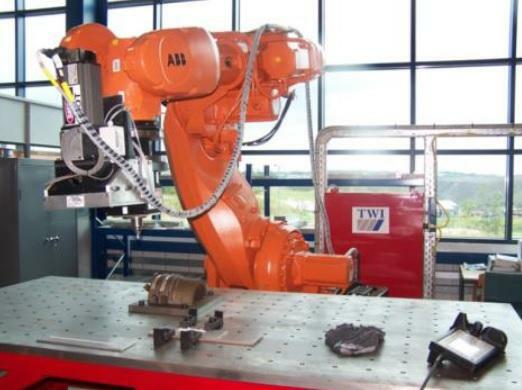 ü Develops new and protectable IP in the area of automated aluminium welding systems – providing European manufacturing industries with added competitiveness and enhancing the move into the ‘knowledge-based’ manufacturing sector. With this, the mainly SME-dominated European fabricators, metal workers and welding companies at large are poised to benefit from a significant reduction in the costs associated with the welding of aluminium components and structures (mainly due to the lack of scrappage and re-working required from an automated system) and are able to create better working conditions for their workforce, as expert welding knowledge will still be required, but physical demands will be greatly reduced. Looking back at what was developed in the FlexiFab project and answering the initial question “Can a robot be used for FSW?”. With FlexiFab, it can. The architecture of the prototype system developed consists of several subsystems and software components to enable path adjustment and control algorithm modifications at the fast low-level controllers, which can be used in any commercial robot for a diversity of FSW tools as bobbin tool, corner tool, adstir tool in 2D and 3 D components. The research was funded by the European Union’s Seventh Framework Programme and managed by REA-Research Executive Agency under grant agreement no. FP7-SME-2013-606156-FlexiFab.